Welcome to Grapevine Physical Therapy & Sports Medicine's resource with respect to recovering from Revision Arthroplasty of the Hip. Over the past 30 years, artificial hip replacements have become increasingly common. Millions of people have gotten a new hip joint. 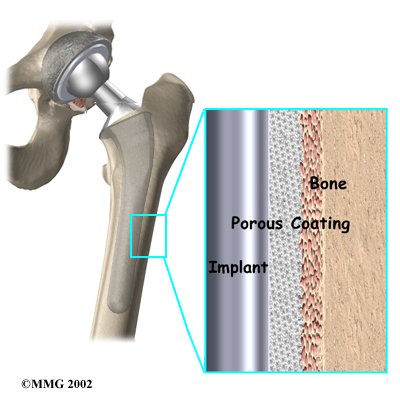 The first time a joint is replaced with an artificial joint, the operation is called a primary joint replacement. As people live longer and more people receive artificial joints, some of those joints begin to wear out and fail. When an artificial hip joint fails, a second operation is required to replace the failing joint. This procedure is called a revision arthroplasty. The hip joint is one of the true ball-and-socket joints of the body. 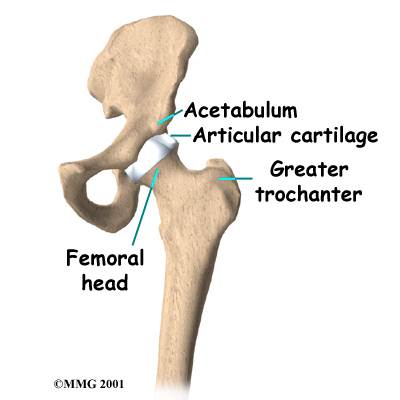 The hip socket is called the acetabulum and forms a deep cup that surrounds the ball of the upper thighbone, or femoral head. Thick muscles of the buttock at the back and the thick muscles of the thigh in the front surround the hip. Why do revisions become necessary? If an artificial joint becomes infected, it may become stiff and painful. It may also begin to lose its attachment to the bone. An infected artificial joint will probably have to be revised to try to cure the infection. In the hip joint, an infected artificial joint may be able to be exchanged for a new artificial joint at the same operation. You will still need to be placed on antibiotics for several weeks or months after the exchange operation. A fracture may occur near an artificial joint. It is sometimes necessary to use a new artificial joint to fix the fracture. 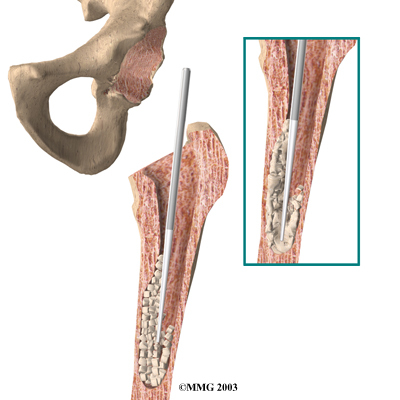 For example, if the femur (thighbone) breaks right below the stem of an artificial hip, it may be easier to replace the femoral part of the artificial joint with a new joint with a longer stem to hold the fracture together while it heals, similar to fixing the fracture with a metal rod. Instability means that the joint dislocates (the metal ball slips out of the plastic socket). This is very painful when it happens. If it happens more than once, it's time to consider revising the artificial hip joint to keep it from coming out of joint. As surgeons have become better at understanding how to put in an artificial joint so that it does not loosen as fast, we have begun to see actual wear of the plastic parts of the artificial joints. In some cases, if the wear is discovered in time, the revision may only require changing the plastic part of the artificial joint. If the wear continues until metal is rubbing on metal, the whole joint may need to be replaced. Finally, another type of wear can occur that breaks the metal due to the constant stress that the artificial joint undergoes everyday. In weight-bearing joints such as the hip, this is greatly affected by how much you weigh and how active you are. You may be scheduled for a bone scan so the surgeon can check for loosening of the artificial joint. When an artificial joint is loose, the bone around the artificial joint reacts by trying to form new bone, a process called remodeling. The bone scan is done by injecting you with a weak radioactive chemical. Several hours later, a large camera is used to take a picture of the bone around the artificial joint. If the artificial joint is loose and there is remodeling going on, the picture will show a hot spot where the chemical has been added to the newly forming bone. The brighter the hot spot, the more likely that the artificial joint is loose. If your surgeon suspects that the artificial hip joint is loose, other tests may be necessary to find out why the hip joint is loose. Before any plans are made to revise the artificial joint, most orthopedic surgeons will want to make sure that the hip is not loose due to infection. Your surgeon may order blood tests to look for signs of infection and may suggest placing a needle into the joint and removing fluid to send to the laboratory and check for infection. Replacing any artificial joint that is infected is much more involved than replacing a noninfected, loose artificial joint. In some cases, infection will make a revision impossible. You may also need to spend time with the Physical Therapist who will manage your rehabilitation after the surgery. The therapist will begin the teaching process before surgery to ensure that you are ready for rehabilitation afterwards. One purpose of the preoperative visit is to record a baseline of information. This includes measurements of your current pain levels, functional abilities, and the movement and strength of each hip. A second purpose of the preoperative Physical Therapy visit is to prepare you for your upcoming surgery. You will begin to practice some of the exercises you will use just after surgery. You will also be trained in the use of either a walker or crutches. This surgery requires the surgeon to open up the hip joint to revise the artificial replacement. This puts the hip at some risk for dislocation after surgery. To prevent dislocating their hip, patients follow strict guidelines about which hip positions they are to avoid, called hip precautions. Your Physical Therapist will go over these precautions with you in the preoperative visit and will drill you often to make sure you practice them at all times for six to 12 weeks after surgery. Finally, the Physical Therapist will assess any needs you may have at home once you're released from the hospital. You may be asked to donate some of your own blood before the operation. This blood can be donated three to five weeks earlier. Your body will make new blood cells to replace the loss. If you need to have a blood transfusion during the operation, you will receive your own blood back from the blood bank. An uncemented prosthesis has a fine mesh of holes on the surface that allows bone to grow into the mesh and attach the prosthesis to the bone. Both are widely used in revision hip surgery. In some cases, a combination of the two types is used in which the ball portion of the prosthesis is cemented into place, and the socket not cemented. The decision about whether to use a cemented or uncemented prosthesis during the revision surgery is usually made by the surgeon based on your age, your lifestyle, and the surgeon's experience. Each prosthesis is made of two main parts. 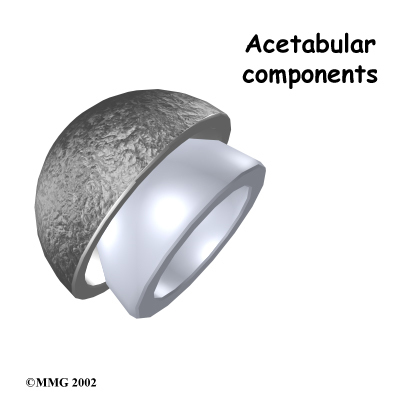 The acetabular component (socket) replaces the acetabulum. The acetabular component is made of a metal shell with a plastic inner liner that provides the bearing surface. The plastic used is very tough and slick, so tough and slick that you could ice skate on a sheet of the plastic without damaging it much. A special type of acetabular component may be used during the revision surgery. This is because the bone of the pelvis may have worn away somewhat since the initial replacement was done. The bone may be weaker, or areas of the bone may be missing. These special components are designed to spread the weight across a wider area on the acetabulum. They attach to the stronger bone outside the area of wear and tear. There are special types of revision stems as well. 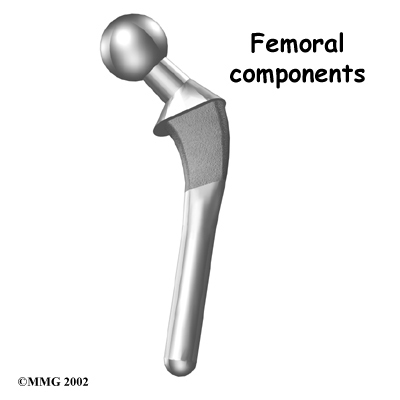 This is because the bone of the femur is usually not the same as when the initial replacement was done. The bone may be weaker, or areas of the bone may be missing. A longer stem can reach further down the femoral shaft and distribute your body weight better. Revision joint replacements are much different from primary joint replacements. One reason that revision procedures are not routine is that there is almost always bone loss around the primary prosthesis. The surgeon deals with this problem by placing a bone graft or some other material around the artificial joint to reinforce the bone. 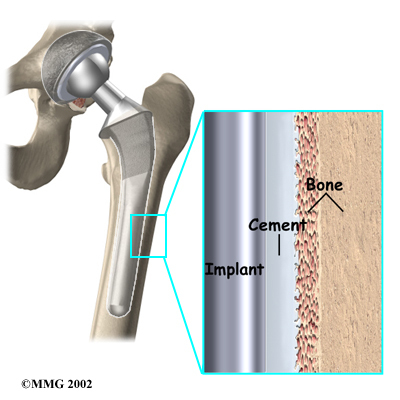 This bone graft may come from your own body, such as bone taken from the pelvis during the same operation. This is commonly called an autograft. When the primary artificial joint has been put in using cement, the cement has to be removed from the socket of the hip as well as from the femoral canal (the bone marrow space in the thighbone). Because the bone is often fragile and the cement is hard, removing the cement sometimes can lead to a fracture of the femur during the operation. This is not unusual, and in most cases the surgeon will simply continue with the operation and fix the fracture as well. In some cases, the femur must be broken open to remove all the cement and the artificial joint. This is one reason that revisions are challenging. a new artificial hip joint will probably be put in, and you will be placed on antibiotics for several months. After application of bone and other materials to rebuild the socket and the femur, a new prosthesis is implanted. Because the natural shape can hardly ever be imitated after rebuilding the bone, most of the time a specially designed prosthesis has to be used. All of this is carefully planned by the surgeon before the operation. A revision joint replacement of the hip is more complex and unpredicatable than a primary joint replacement. Since many factors can influence its longevity, your surgeon will not be able to say exactly how long your revision will last. Sometimes a choice other than hip revision is best because a big operation might result in a failure, or even death. Removing the prosthesis and not replacing it doesn't mean the patient can't walk anymore, but walking will be much more difficult because the leg grows shorter and the power in the leg is reduced. The risk of infection is higher in revision joint replacement than in primary joint replacement. In a primary hip replacement, the risk of infection is 0.5 to one percent. It goes up to two percent or more in revision cases. These figures are only an estimate and vary between different scientific studies. Just like your real hip, the revised artificial hip can dislocate if the ball comes out of the socket. There is a greater risk just after surgery, before the tissues have healed around the new joint, but there is always a risk. A Physical Therapist will instruct you very carefully on how to avoid activities and positions that may have a tendency to cause a hip dislocation. Myositis ossificans is a curious problem that can affect the hip after both a primary hip replacement and a revision hip replacement. The condition occurs when the soft tissue around the hip joint begins to develop calcium deposits. Myositis means inflammation of muscle and ossificans refers to the formation of bone. This can lead to a situation where bone actually forms completely around the hip joint. This leads to stiffness in the hip resulting in much less motion in the hip joint than normal. It also causes pain. Myositis ossificans is more common in people who have a long history of osteoarthritis with multiple bones spurs. Something about the genetic makeup in these people makes them more likely to produce bone tissue. Major reconstruction operations such as a hip revision seem to do more damage to the surrounding tissues than primary hip replacements. The operation is simply longer and harder to do. Calcium deposits are also more likely to form. If myositis ossificans forms despite these precautions, treatment will depend on how much it affects your hip--how much pain it causes and how much it restricts motion. In some severe cases, you may choose to have a second operation to remove the calcified tissue that has formed. This is usually followed by radiation treatments to prevent the calcium deposits from returning. The major reason that artificial joints eventually fail continues to be a process of loosening where the metal or cement meets the bone. A loose revised prosthesis is a problem because it causes pain. Once the pain becomes unbearable, another revision surgery may be needed. The rate of loosening of revision arthroplasties is higher than in primary arthroplasties. After surgery, your hip is covered with a padded dressing. Special boots or stockings are placed on your feet to help prevent blood clots from forming. A triangle-shaped cushion may be positioned between your legs to keep your legs from crossing or rolling in. Physical Therapy treatments are scheduled one to three times each day as long as you remain in the hospital. Your first treatment is scheduled soon after you wake up from surgery. Your therapist will begin by helping you move from your hospital bed to a chair. By the second day, you'll begin walking longer distances using your crutches or walker. You may not be allowed to put weight on the affected leg for a period of time. This varies from surgeon to surgeon and is also affected by how well your surgeon thinks the operation went. Your Physical Therapist will go over exercises to begin toning and strengthening the thigh and hip muscles. Ankle and knee movements are used to help pump swelling out of the leg and to prevent the formation of blood clots. You will need to follow hip dislocation precautions--just like after your first artificial hip replacement. 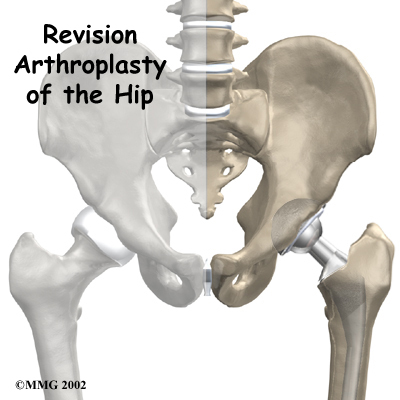 The risk of dislocation after a revision is higher than after a primary hip replacement. Patients are usually able to go home after spending four to seven days in the hospital. You'll be on your way home when you can demonstrate a safe ability to get in and out of bed, walk up to 75 feet with your crutches or walker, go up and down stairs safely, and consistently remember to use your hip precautions. Patients who require extra care may be sent to a different unit until they are safe and ready to go home. Most of the time your surgeon will see you one or more times during outpatient visits. Depending on what is learned from the examination and X-rays, you may start to put full weight on your leg. Because the operation is more complicated than primary replacement surgery and the period of walking on crutches may take longer, you must realize that it will take at least a year to be able to perform all normal daily activities. In some patients the possibilities are more limited than before. Be aware that a revision hip prosthesis is not as good as a primary prosthesis. There is always a chance that the donor bone will disappear in time because it is dead material and will be reabsorbed by the body. This means that loosening can occur once more. Today no other materials are available that are superior to donor bone. When you begin our Grapevine Physical Therapy & Sports Medicine rehabilitation, our Physical Therapist will design a personalized exercise program, work with you on your hip precautions, and make recommendations about your safety. These recommendations may include that you use a raised commode seat and bathtub bench, and that you raise the surfaces of couches and chairs in your home. This keeps your hip from bending too far when you sit down. Bath benches and handrails can improve safety in the bathroom. Other suggestions include the use of strategic lighting and the removal of loose rugs or electrical cords from the floor. You should continue to use your walker or crutches as instructed. If you had a cemented procedure, we'll advise you to advance the weight you place through your sore leg as much as you feel comfortable. If you had a noncemented procedure, we may want you to place only the toes down for up to six weeks after surgery. Although the time required for recovery varies, most patients progress to using a cane in four to six weeks. Your staples will probably be removed two weeks after surgery. Patients may able to drive within three weeks and walk without a walking aid by two to three months. Upon the approval of our Physical Therapist, you are generally able to resume sexual activity by one to two months after surgery. Additional visits to the Grapevine Physical Therapy & Sports Medicine facility may be needed for patients who are still having problems walking or who need to get back to heavier types of work or activities. Our Physical Therapist may use heat, ice, or electrical stimulation if you have swelling or pain. We sometimes treat patients in a pool. Exercising in a swimming pool puts less stress on the hip joint, and the buoyancy lets you move and exercise easier. Once you've gotten your pool exercises down and the other parts of your rehab program advance, we will instruct you in an independent program. When you are safe in putting full weight through the leg, our Physical Therapist can recommend several types of balance exercises to further stabilize and control the hip. Finally, a select group of exercises can be used to simulate day-to-day activities, such as going up and down steps, squatting, and walking on uneven terrain. We may then choose specific exercises to simulate work or hobby activities. Many patients have less pain and better mobility after hip revision surgery. Our Physical Therapist will work with you to help keep your revised joint healthy for as long as possible. This may require that you adjust your activity choices to keep from putting too much strain on your revised hip joint. Heavy sports that require running, jumping, quick stopping and starting, and cutting are discouraged. Patients may need to consider alternate jobs to avoid work activities that require heavy lifting, crawling, and climbing. Our goal is to help you maximize strength, walk normally, and improve your ability to do your activities. When your recovery is well under way, your regular visits to Grapevine Physical Therapy & Sports Medicine will end. Although we will continue to be a resource, you will be in charge of doing your exercises as part of an ongoing home program.